On occasion I speak to people who have tried the Net Promoter approach but it failed and they canned the whole project. After discussing it with them I find it always comes down to just a few reasons. So if your Net Promoter project failed, or it’s looking a bit shaky, look down the list to find out what happened and fix it now. There are plenty of good market research approaches out there but Net Promoter is not one of them. As a transactional customer feedback tool, NPS® excels. 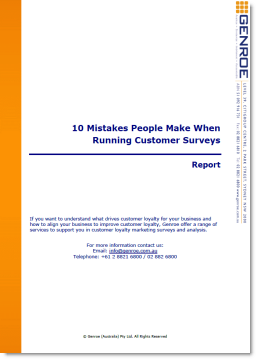 It helps you to uncover current high impact customer issues and how to fix them. Customers responding to transactional surveys will tell you that you failed to deliver your widget to them on time, or that your web check out is too hard to use. They will tell you exactly where the problem is and often how to fix it. However, it is not market research and it will fail if you try to make it do that task. We’ve all seen them. The chart showing the NPS target for the month, the gap to actual and the attempt to post-hock justify the difference in the chart comments. Just don’t do it. This doesn’t work for two reasons. Net Promoter has some curious features and care needs to be taken to be sure you really know when a change has occurred in the Net Promoter score. What looks like a change may just be statistical noise and not worth commenting upon. If you are reasonably sure (95%) that a change has occurred you may run into the second issue. Tracking exactly what has impacted on your score is not like doing the variance report on the last widget production run. A single factor, like Bob in shipping being off sick this month, is not likely to drive a change in your score. The items that might impact on a single month’s NPS are many and varied and you cannot always link changes to specific external factors. However, you should still chart you score but focus on the trend. The trend is your friend. Look to see how the score is moving over time. Is it generally increasing or decreasing? I’ve talked before about discontinuous and continuous innovation. Net Promoter is a very good continuous innovation tool. It can help you to make continuous changes to your business to improve customer loyalty. What it does not do so well is discontinuous innovation: coming up with the automobile, iPAD or Walkman. I say “not so wel”l because recently a customer told me that they estimate that 1 in 1,000 customer comments is the gem of an idea for a discontinuous innovation opportunity. Your’e collecting NPS week after week, month after month. Did the score change? No! Well of course not. Weighing a pig doesn’t make it fatter. It is not enough to add a the “would recommend” question to your current customer survey. You have to collect the score AND information on why customers gave you that score AND you have to make some changes in your business. This is the real key. NPS is just a way of identifying where you are up to. To improve the score you have to make change within your organisation and it is only the qualitative feedback, and perhaps scored attribute questions, that can help you to do that. Okay so you’re knee deep in data and you’ve got verbatim customer comments flowing down the sides of your desk. So what. Now you have to make sense of all that data and do some root cause analysis. To do that you probably need to use some quality system tools like “The Five Whys“. You collected some great data and performed a really excellent root cause analysis process. The result was a terrific opportunity to improve the NPS but management would never sign off on the funding because you couldn’t justify the ROI. Did you calculate the value of a Promoter and factor that into your business case? Often it is not difficult to do this calculation — we published an example of how to value a promoter. The trouble is that without this piece of information you will be hard pressed to make any business case watertight. So did the reasons you quit turn up in this list or was it some other issue? Either way please let me know your experiences in the comments below. This is comprehensive and clear. NPS has to be understood in some depth to really appreciate what can be achieved with it. Too many people focus on outcomes i.e. the score and not the continuous feedback aspect to it! Thanks for your comment — focusing on outcomes is a good idea but the goal should be how to change the outcomes not the score itself. This is such a simple view on the things and so eye-opening in the same time. It generates a lot of thoughts. In our case, looking at the trend and some other KPIs, we can say that there is a seasonal effect on the score, for sure. Also, if we are sure what was the impact on NPS during one month, why not to comment on this? To what extent do you thing it is wrong or right to link NPS to seasonality or to certain major actions/events that had an impact on NPS? Many of our customers see a seasonal effect in their scores, which is why it is important to wait before setting any targets. There is nothing wrong in reporting that a particular change in NPS can be attributed to a particular situation. It only becomes un-useful when you try to find a reason for every little change — a bit like the stock market analysts telling you what caused each and every minor change in the share price. It’s not real. Humans are very good at seeing patterns when there are often none so just accept that and focus on the big items. Thanks a lot. It makes sense.